MMX Racing APK 1.16.9304 comes to bring your desire as truck racer into reality. 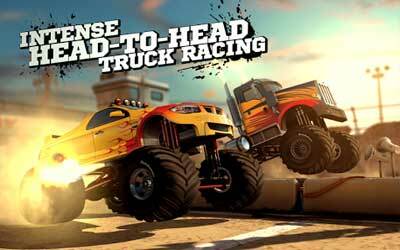 As mentioned before, it is all about monster truck racing in which you are the driver. The aim of this game is to be the best truck racer in international circuit. To get your main purposed, you need to have couple of racings in which you should do your best. You are able to buy, increase and named your truck as part of customization. The truck will be as real as possible, simply like you have your own race truck. You also can improve its performance and appearance to be better in every race. One of the most important things to be improved is the speed, so you can win in every competition. The game will begin on the jumping area in which you should jump your truck into the ground. The way to play this game is very simple and easy; you just need to tap the screen on the right time. Hold the gas then release it whenever the truck reaches the hill and then hold the gas when the truck is on the track. If you did in the wrong time, your tuck will get slower and your rivals can get ahead. This game is officially launched at February 15, 2016 by Hutch Games as the developer. It is build by performing outstanding graphic and sound quality, so the users will not get bored to play. There will be ten different events are thirty heart-pounding tracks which give you thousands of competitive opponents. The more you play, the more you will be trained. This game needs at least 315 megabyte of free space on your device. In addition, your Android operating system should be at least 4.0.3 or higher. Stop reading! Download your own MMX Racing for android and be the best monster truck racer in the universe. Turn it into the Monster you know it wants to be. RIVAL CRUSHING 10 different events, 30 challenging tracks and THOUSANDS of opponents in your way.